Below you can view all the homes for sale in the Cambridge subdivision located in Johns Creek Georgia. Listings in Cambridge are updated daily from data we receive from the Atlanta multiple listing service. To learn more about any of these homes or to receive custom notifications when a new property is listed for sale in Cambridge, give us a call at 404-998-4017. Active Community Offers S/T, Park, Clubhouse, & Organized Parties. MLS#6534165. Keller Williams Rlty, First Atlanta. Upstairs Includes A Gorgeous Master W/Trey Ceiling, His/Her Closets, Completely Remodeled Bathroom & Bonus Room Over The Garage Perfect For An Office. MLS#6523739. Keller Williams Rlty-Ptree Rd. Finished Daylight Terrace Level Has Theater Room, Game Room/Family Room, Guest Bed, Full Bath, Office/Playroom & Wrought Iron Gated Wine Storage Area! MLS#6512787. 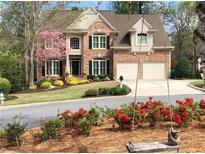 Atlanta Fine Homes Sothebys Intl..
Short Distance To The Neighborhood Club Area! MLS#6508696. Atlanta Fine Homes Sothebys Intl..